And so it is that the more genteel half of Salad King has moved North to the suburbs. No longer tucked away on a second floor, Linda is now front and centre, at the heart of The Shops at Don Mills. Red, gold, and black are the predominant colours in the new space. 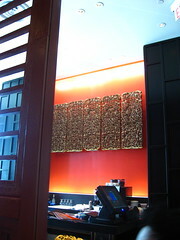 Intricate carvings from Thailand decorate the walls and tall screens divide the main area. It’s an impressive-looking room with upscale touches to match its new environs. While there are those who lament its move, I found that on my lunch and dinner visits during their soft opening, there were still old comforts to be had, even as Linda now caters to a broader audience. 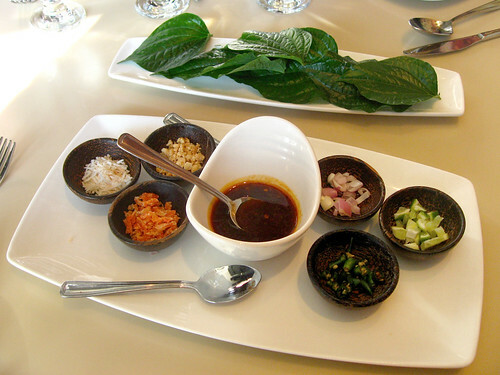 Mieng Kum, an appetizer where you have bits of chili, coconut, peanut, dry shrimp, shallot and lime, dress it with some sauce, and wrap it in a leaf. I enjoyed this both for the novelty and the taste. Beef Penang was first on our list to order. 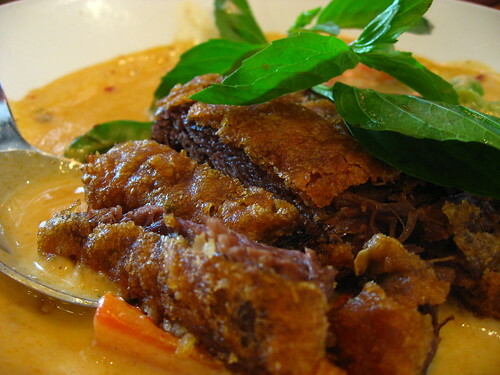 Crispy top on braised beef in red curry. Really tasty with a bowl of hot rice. 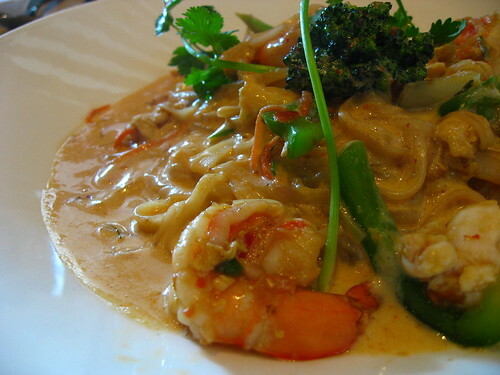 Linda's upgraded version of the Thai Islamic Noodle features plumper shrimp and more seafood. The sweet and spicy sauce makes this one of two dishes I always order from Salad King. 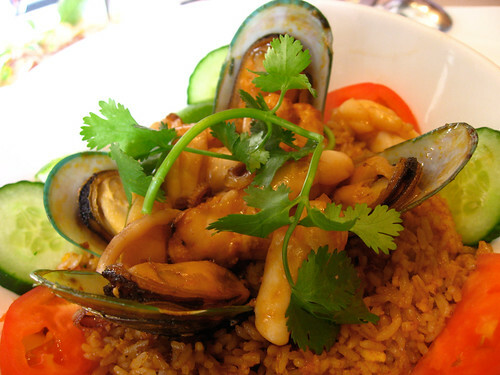 Another import from Salad King, (and my other staple dish there), upgraded and gussied up, is the Seafood Fried Rice. 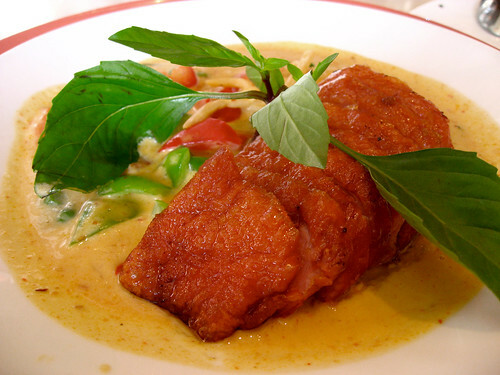 Smoked duck in red curry sauce. While I liked the smoky flavour of the duck, the curry is the same as the Beef Penang, so I probably wouldn't order both at the same time, lovely as the red curry is. 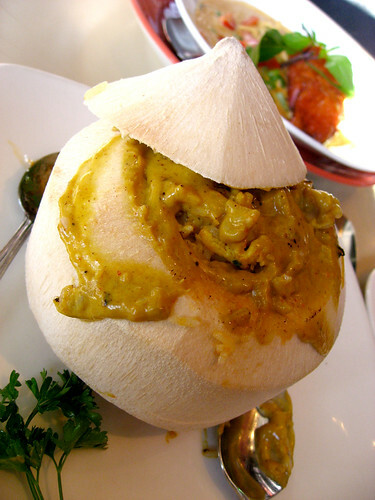 A seafood fried rice is baked in a young coconut, imparting its milky flavour in the process. I like scraping the young coconut out after digging out the rice and chunks of seafood. 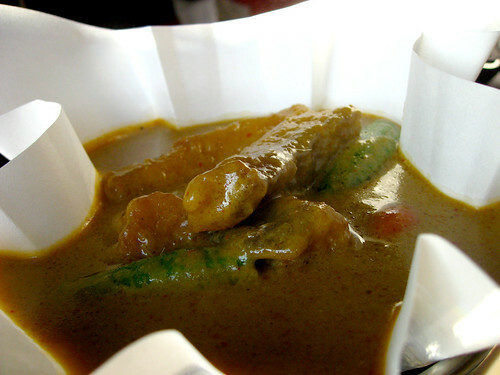 Curry fish hot pot. Something I wouldn't have ordered myself, given my dislike of fish curry and okra. Turns out I can enjoy not just either, but both at once. There are menu shots and other things we ordered that I didn’t post up here that you can take a look at below. Yummy, the seafood rice in the coconut was always my favorite and I never went back…now I know where I’m off to since it’s just up the street!